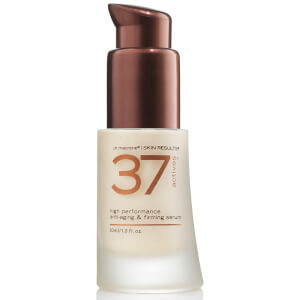 With the patented One-Step Skin Care Solution®, the 37 Actives high performance anti-aging neck and décolletage Treatment provides over 37 anti-aging ingredients in one bottle and features several new important actives to target elasticity & reverse sun damage common to the delicate areas of the neck & chest. These powerful ingredients also help to reverse the free radical attack caused by sugar and environmental pollutants. Anti-Telomerase: Includes a red alga extract to address the appearance of cosmetic aging of the skin over time. Anti-Glycation: An active area of research is the role of sugar molecules and how they contribute to the skin aging process by damaging tissue, a process called glycation. Among the identified anti-glycation compounds are resveratrol from red grapes & phenolic compounds from a number of plant anti-oxidants. Sun Damage Repair: Includes a number of repair agents for reversing the free radical attack on the skin from sun exposure. Such actives include watermelon extract, which is packed with ingredients that protect this fruit from the barrage of UV rays. Anti-Pollution: Polycyclic aromatic hydrocarbons (PAHs) are adsorbed onto the skin’s surface in urban areas, which are then converted to quinones that cause the formation of free radicals that attack the skin. To guard against this are two forms of lipoencapsulated Vitamin C, Vitamin E and Ferulic Acid, and a host of plant-derived anti-oxidants that are included in our daily one step regimen. Apply twice daily to neck and chest after cleansing. Water, Dimethicone, Glycerin (plant-derived), ProheptylCaprylate, Helianthus anuus (Sunflower) Oil Unsaponifiables (plant-derived), Palmitoyl Hydroxproline, Sorbitan Stearate (plant-derived), Pentylene Glycol, Butylene Glycol, Resveratrol (plant-derived), Tetrahexyldecyl Ascorbate, Acetyl Tyrosine, Adenosine Triphosphate, Bisabolol (plant-derived), Sodium Hyaluronate (plant-derived), Glucosamine Phosphate, Arginine (plant-derived), Aspartic Acid (plant-derived), Glycine (plant-derived), Alanine (plant-derived), Serine (plant-derived), Valine (plant-derived), Proline (plant-derived), Threonine (plant-derived), Isoleucine (plant-derived), Histidine (plant-derived), Phenylalanine (plant-derived), Squalane (plant-derived), Camellia Sinensis Leaf (Green Tea) Extract*, Phellodendron Amurense (Bark) Extract, Theobroma Cacao (Cocoa) Seed Butter*, Kappaphycus Alvarezii (Red Algae) Extract, Punica Granatum (Pomegranate) Extract*, Coffee Arabica (Coffee) Seed Extract*, Citrullus Lanatus (Watermelon) Fruit Extract, Chyrsanthemum Parthenium (Feverfew) Extract*, Santalum Album (Sandalwood) Extract, Ilex Paraguariensis Leaf (Yerba Mate) Extract*, Hordeum Distichon (Barley Extract), Tremella Fuciformis (Mushroom extract) Polysaccharide, Simmondisa Chinensis (Jojoba) Esters (plant-derived), Sodium PCA (plant-derived), Pyrrolidone carboxylic acid (plant-derived), Citrulline, Sodium Lactate, Hydrolyzed Vegetable Protein, Hydrogenated Lecithin, Cetyl Alcohol (plant-derived), Xanthan Gum (plant-derived), Disodium EDTA, Ethylhexylglycerin (plant-derived), Decylene Glycol, Alcohol (plant-derived), Hydroxpropylmethylcellulose Stearoxy Ether (plant-derived), 1 ,2 Hexanediol, Phenoxyethanol, Sodium Benzoate, Sodium Hydroxide, Sodium Methyl Stearoyl Taurate, Potassium Sorbate. This cream instantly made my skin on my neck much more toned and moisturized. It worked right away and made my skin feel much more elastic and tighter. I didn't expect it to work that quickly. My skin just drinks it up.